Here’s another way you can stop your dog from jumping up at people they meet. A dog that can shake paws instead will always be popular with visitors! Here’s what to try at home. With your dog sitting, hold a small treat firmly in your hand so they can smell it, but not see it. Put your hand near your dog’s nose but to one side so they turn their head slightly. (This will take the weight off the leg you’re going to ask your dog to lift). Encourage your dog to try to get the treat – most dogs will try to open your hand with their paw. As soon as their paw touches your hand, open your hand and let them have the treat, praising as you give it. Repeat this several times. By alternating from one side to the other, your dog should learn to use the right paw each time. Once your dog’s doing this easily, start adding a verbal command before you give the reward. When your dog touches your hand with their paw, say something like, “how do you do!” and give them the treat. With a treat in one hand, hold out your other hand in an open position towards the leg you want your dog to lift. 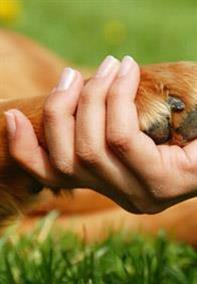 As soon as your dog touches your open hand with their paw, say “How do you do!” and reward them. Repeat several times with both paws. Keep practising and your dog will soon respond to the command “how do you do!” by lifting whichever paw you offer your open hand to.